Ill play it tonight and send it the night after. How about we conquer the entire map for a change? We never did that. I have this feeling that it's going to take us long enough to get 50 territories, let alone the whole map. I've played a few games where I have close to all 102 territories, but that's taken me a really long time (in real time) as well as most of the 280 years of game time. Thats easy. :P update coming up tonight, been a bit busy with work, now that ive quit, ive got loads of time. Destroying the roman factions is hardly a challenge anymore at your current point in the game. When I got bored with my private Pontus game, I had 4 regions left to conquer for victory with 50 regions. And it was 220 BC, not sure what the exact end date is though. You're looking pretty good there Thompsoncs; the end date is around 10 AD, as I recall. 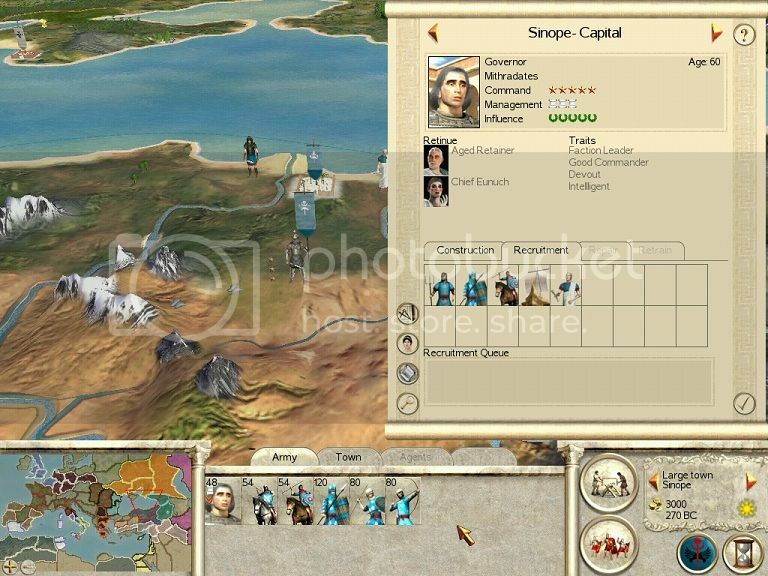 Wow, it looks like you took the roman factions and colored them blue. You even sacrificed your home to fulfill your conquest. That's because like this swap game, it was a challenging migration campaign, that turned out to be easier than expected. The main reason for my fast expansion was my clean victory over the SPQR. I did not face a single attack from the scipii or brutti in italy after I took their cities there. So instead of being forced to turtle to defend south italy, I could steamroll the Julii. After that it's easy. You have phalanxes, carthage is underpowered (especially when commanded by the computer), Spain isn't much of a match, Britons die easy at spearpoints, germanics are a bit tough, but still no match. 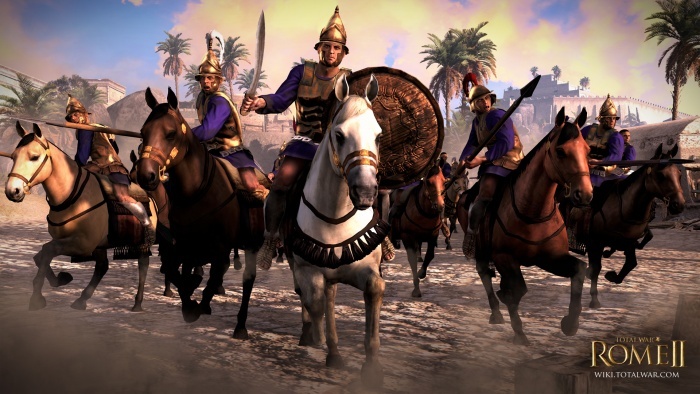 In the east the Greeks are a bit of an issue due to their better armoed hoplites, yet they entirely lack decent cavalry. If I will continue this, egypt will be the biggest problem. The roman reforms did not happen, so the egyptian generals are still annoying missile chariots. And their archers are much better. Their chariots mean I can't use my cavalry as well as I would like and their phalanx is only a bit weaker than the pontic onces. Egypt is always a nightmare to fight, no matter which faction I use. And egypt owns about everything to the east of me. They even took lepcis magna before I declared war and took it from them. Beseieged arretium, the julii sallied and got their arse handed to them, they lost 1500 men while i only lost 200, i capture it the next turn and thanks to a spy i capture segesta and patavium in the same turn with minimal casuslties, two turns later we captured mediolanum, however with big losses, after destroying a julii army i captured iuvavum. I spent two years consolidating. I ended my reign by slaughtering 1500 brutii for minimal loses and putting caralis, apollonia and segestica under seige. In short, we doubled our territory, we have 3 cities under seige, plus massila looks tempting. Get caralis and we remove the julii. I suggest we move on to sicily next then the balkans. Wow. You're just whipping along, Bulba. Good going. I shall work on my turns shortly (I hope, if school doesn't make me too busy). Ive got to thank the other players for such solid foundations, I havent played RTW for 6 months before this swap, now im feeling a new campaign. To begin, I took Segestica (result), Apollonia (result, also, wardogs don't fare very well against peltasts and Cretans), and Caralis (result), which wiped out the Julii. Also, while Onagers are terribly slow on the campaign map, I love them in city battles (one and two); they even killed a few enemy. The Brutii also put a larger army on a single bireme, which I sank . On the northern coast of the Ionian, the Macedonians were out in force, but the Brutii scared them off. In my last turn, I took Massilia (result). I leave us here, with a large treasury surplus. I've passed the save on to Hannibal. Nice work, Bulba and Sajaru! I shall resume my reign either today or on Thursday, due to the exams I have at the moment. Nice job. Just like I was, you're now expanding in all directions and with good economy I would like to see someone stop it. Sicily, Greece and Gaul will soon be Pontic. I'm surprised to see that you lost 33 battles though. Must have been navy battles right? I usually keep navies either big enough to not lose or move them from port to port, thus my 4 battles lost in a later stage of the campaign. On land I must be severly outclassed to lose to the ai. The only settign where the ai could do that is when it defends a stone walled city against me with good infantry. Don't mean to intrude, but I thought you gentlemen might like to know that Pontus has been declared as the 9th playable faction for Rome 2! 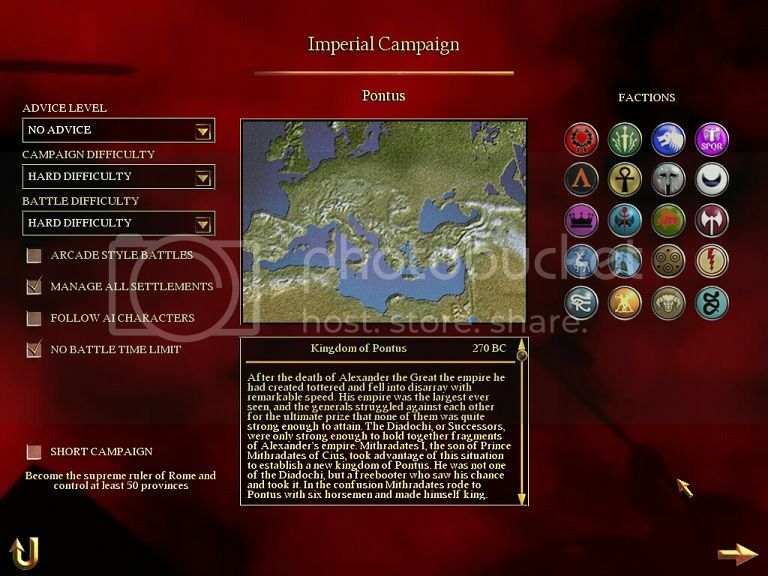 Though CA said there would only be 8 playable factions at launch, Pontus will be a free DLC (or rather Free-LC) available for download on Steam upon Rome 2's worldwide release later this year. Feel free to stop by Afty's thread to celebrate this magnificent news! I had a few days with a bit more free time. I conquered the entire map for the 2nd time (1st time as scipii when I first got the game, easy difficulty autoresolve). End date 198 BC, 22 years since my previous screenshot. The egyptians held the entire east, and I sometimes fought 3 battles or more with them in 1 turn. I faced 3 rebellions, which I like. A few phalanxes can crush any rebellion and an exterminated city will remain happy for quite a while. Let's see if the swap team likes to challenge my result and conquer the map before 198 BC. Once you get a few full stacks and more money than you can ever hope to spend, you can steamroll everything. And a decent phalanx line backed up by lots of archers (only need a few cav to chase routers) can take on any egyptian army. Only a lot of pharoahs bowmen or guard can be difficult. Btw, you should watch the m2tw youtube series by legend of totalwar. He conquered the entire map (not the new world) within 14 turns), mostly with bodyguard charges. Sadly bodyguards are less tank-like in rtw. Oh, I know that it can be done, but I prefer to make sure every town has a full army of good troops in it, which takes me far more time than the actual conquering part. I'm going to give Hannibal one more day, then I'll shoot it over to you (unless Average Citizen really wants it this instant). Alex finished up his turns; apparently he hasn't had a chance to upload is summary yet. However, I think it's time to pass it on to Average Citizen. In case anybody wanted to know, we've captured two more territories, including one on Sicily, the Marius event has occurred, and we're about to take Salona. Wow, Marius triggered. Then you get the cataphract bodyguards right, should be better than the bodyguards I had to capture the world with. And enemy improved bodyguards will simply die on a phalanx point. And the Romans should be in a position that they cant really benefit anymore from the reforms. Most of the people I've been sending it to haven't been sending it back. If people want to continue on, please let me know, and I'll be happy to send it to the next person (who's Bulba). I'm Bulba, I havent recieved any emails so thought nothing of it. With six to eight weeks of ABSOLUTELY no activity, I hereby declare this Swap Game dead and buried. Be advised: a new one will be coming soon.